For almost a generation, psychologists around the world have been engaged in a spirited debate over a question that most of us would consider to have been settled years ago. The question is this: is there such a thing as innate talent? The obvious answer is yes. Not every hockey player born in January ends up playing at the professional level. Only some do--the innately talented ones. Achievement is talent plus preparation. The problem with this view is that the closer psychologists look at the careers of the gifted, the smaller the role innate talent seems to play and the bigger the role preparation seems to play. Exhibit A in the talent argument is a study done in the early 1990s by the psychologist K. Anders Ericsson and two colleagues at Berlin's elite Academy of Music. With the help of the Academy's professors, they divided the school's violinists into three groups. In the first group were the stars, the students with the potential to become world-class soloists. In the second were those judged to be merely "good." In the third were students who were unlikely to ever play professionally and who intended to be music teachers in the public school system. All of the violinists were then asked the same question: over the course of your entire career, ever since you first picked up the violin, how many hours have you practiced? Everyone from all three groups started playing at roughly the same age, around five years old. In those first few years, everyone practiced roughly the same amount, about two or three hours a week. But when the students were around the age of eight, real differences started to emerge. The students who would end up the best in their class began to practice more than everyone else: six hours a week by age nine, eight hours a week by age twelve, sixteen hours a week by age fourteen, and up and up, until by the age of twenty they were practicing--that is, purposefully and single-mindedly playing their instruments with the intent to get better--well over thirty hours a week. In fact, by the age of twenty, the elite performers had each totaled ten thousand hours of practice. By contrast, the merely good students had totaled eight thousand hours, and the future music teachers had totaled just over four thousand hours. Ericsson and his colleagues then compared amateur pianists with professional pianists. The same pattern emerged. The amateurs never practiced more than about three hours a week over the course of their childhood, and by the age of twenty they had totaled two thousand hours of practice. The professionals, on the other hand, steadily increased their practice time every year, until by the age of twenty they, like the violinists, had reached ten thousand hours. The striking thing about Ericsson's study is that he and his colleagues couldn't find any "naturals," musicians who floated effortlessly to the top while practicing a fraction of the time their peers did. Nor could they find any "grinds," people who worked harder than everyone else, yet just didn't have what it takes to break the top ranks. Their research suggestes that once a musician has enough ability to get into a top music school, the thing that distinguishes one performer from another is how hard he or she works. That's it. And what's more, the people at the very top don't work just harder or even much harder than everyone else. They work much, much harder. "The emerging picture from such studies is that ten thousand hours of practice is required to achieve the level of mastery associated with being a world-class expert--in anything," writes the neurologist Daniel Levitin. "In study after study, of composers, basketball players, fiction writers, ice skaters, concert pianists, chess players, master criminals, and what have you, this number comes up again and again. Of course, this doesn't address why some people get more out of their practice sessions than others do. But no one has yet found a case in which true world- class expertise was accomplished in less time. It seems that it takes the brain this long to assimilate all that it needs to know to achieve true mastery." This is true even of people we think of as prodigies. Mozart, for example, famously started writing music at six. But, writes the psychologist Michael Howe in his book Genius Explained, by the standards of mature composers, Mozart's early works are not outstanding. The earliest pieces were all probably written down by his father, and perhaps improved in the process. Many of Wolfgang's childhood compositions, such as the first seven of his concertos for piano and orchestra, are largely arrangements of works by other composers. Of those concertos that only contain music original to Mozart, the earliest that is now regarded as a masterwork (No. 9, K. 271) was not com posed until he was twenty-one: by that time Mozart had already been composing concertos for ten years. The music critic Harold Schonberg goes further: Mozart, he argues, actually "developed late," since he didn't produce his greatest work until he had been composing for more than twenty years. To become a chess grandmaster also seems to take about ten years. (Only the legendary Bobby Fischer got to that elite level in less than that amount of time: it took him nine years.) And what's ten years? Well, it's roughly how long it takes to put in ten thousand hours of hard practice. Ten thousand hours is the magic number of greatness. Here is the explanation for what was so puzzling about the rosters of the Czech and Canadian national sports teams. There was practically no one on those teams born after September 1, which doesn't seem to make any sense. You'd think that there should be a fair number of Czech hockey or soccer prodigies born late in the year who are so talented that they eventually make their way into the top tier as young adults, despite their birth dates. But to Ericsson and those who argue against the primacy of talent, that isn't surprising at all. That late-born prodigy doesn't get chosen for the all-star team as an eight-year-old because he's too small. So he doesn't get the extra practice. And without that extra practice, he has no chance at hitting ten thousand hours by the time the professional hockey teams start looking for players. And without ten thousand hours under his belt, there is no way he can ever master the skills necessary to play at the top level. Even Mozart--the greatest musical prodigy of all time--couldn't hit his stride until he had his ten thousand hours in. Practice isn't the thing you do once you're good. It's the thing you do that makes you good. The other interesting thing about that ten thousand hours, of course, is that ten thousand hours is an enormous amount of time. It's all but impossible to reach that number all by yourself by the time you're a young adult. You have to have parents who encourage and support you. You can't be poor, because if you have to hold down a part-time job on the side to help make ends meet, there won't be time left in the day to practice enough. In fact, most people can reach that number only if they get into some kind of special program--like a hockey all-star squad--or if they get some kind of extraordinary opportunity that gives them a chance to put in those hours. 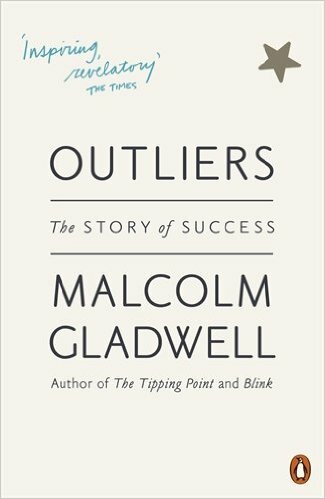 In this bestselling novel, author Malcolm Gladwell talks about 'outliers' - explained by him as individuals who cannot grasp the ordinary understanding of accomplishment. The book deals with extraordinary people, especially those who are rich, successful, smart and who dare to function where many fail to believe it is possible. He answers questions pertaining to what high-achievers do differently than others to reach their goals. They pay very little attention to their cultural background, family and the eccentric experiences of their upbringing which defines their zeal to excel. To explain this further he talks about what it takes to be a great soccer player or how Bill Gates made such extreme wealth or how The Beatles became one of the most successful rock bands of all times and many such examples.